Navels are just one of the cultivars of oranges (Citrus sinensis) grown in Florida. Prized for their easy to peel, sweet, seedless fruits, the “navel” on one end is their distinguishing mark. Navel oranges ripen from October through January, with trees producing large, bright orange fruits. Trees are medium-sized orange trees, reaching approximately 15 to 20 feet at maturity and require the same basic care as all varieties of citrus. As long as Florida gardeners meet the tree’s basic requirements, their navel will almost be maintenance free. Plant your navel orange tree in an area that receives approximately six hours of sunlight each day. Orange trees will not grow well if planted in shade. Select an area that drains well and is not continuously saturated with water, as the tree will die of root rot. Grow the navel orange tree in a protected area of your Florida landscape if you live in an area prone to frost. Navel orange trees are frost sensitive. Plant the tree on the south side of your house with protection such as a clump of vegetation close by or a structure. 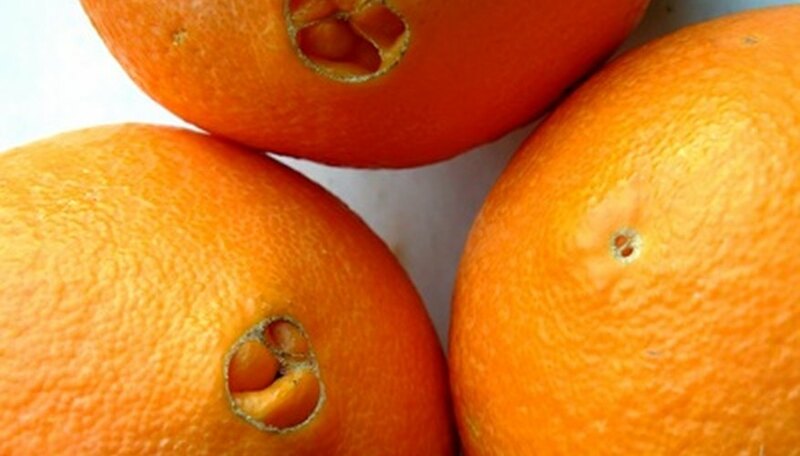 Clear the area beneath the navel orange’s canopy free of any weeds or grasses. Keep the area weed-free, as the unwanted vegetation will rob the navel orange tree of water and nutrients. Plant your navel orange tree no deeper than it is growing inside of the original container. Dig a hole two times larger than the orange tree’s root ball to loosen the surrounding soil. Place the tree into the hole, fill halfway with soil, tap down and fill with water. Allow the water to drain and fill the remainder of the hole with soil and repeat watering and stomping on the soil to release any remaining air pockets. Water newly planted navel orange trees three times per week for the first two weeks. Gradually taper off watering to once every seven to 10 days. Depending on your local Florida weather, navel orange trees require consistent watering for best growth and production of fruit. Fertilize 1- to 2-year-old trees every other month with a citrus special 8-8-8, per package instructions. Cut back fertilizing fruit-bearing trees to three times per year in January, June and November. Spread the fertilizer under the tree’s canopy and water in thoroughly, not allowing it to touch the orange tree’s trunk. Spray the navel orange tree annually with a citrus nutritional spray to correct and prevent any element deficiencies. Prune the navel orange tree to remove only dead wood or branches that crisscross each other. Florida navel orange trees grow best and produce the most fruit when left to grow in a natural state. Protect the navel orange tree from frosts or freezes by bringing container-grown trees indoors or bunching them together with other plant to create heat. Cover trees in the ground with cloth sheets, quilts and burlap or Christmas lights. Water the soil and foliage thoroughly before the freeze to help the tree maintain heat. Navel oranges will not ripen any further once picked from the tree.